It was 6:30 on a Friday night, and it was evident that Empire Biscuit was just waking up for the evening. You see, they’re open 24 hours, seven days per week, so 6:30 on a Friday night is practically 6:30 on a Saturday morning to me. Their motto (?) “breakfast – lunch – dinner – drunk” speaks volumes to the type of clientele Empire Biscuit attracts; that is to say, the inebriated at 1 am. And I can see why. Biscuits can go a long way in sopping up all the alcohol in the anti-teetotaler’s belly. But we were there for a legitimate dinner, and almost found one, I swear. Though rife with biscuit options and delicacies, the Empire Biscuit menu is lonesome for some side dishes. Would it kill them to put fries on the menu? Even a fruit salad would satisfy the dinner-seeking patron, though not this one. In addition to a menu void of anything but biscuits, their drink options are equally disappointing. Empire Biscuit’s namesake cola tastes like liquorice and herbs–nothing like a Coke Zero or any kind of homebrew cola I’ve ever had (not that I’ve had many). At least it was carbonated, I guess. 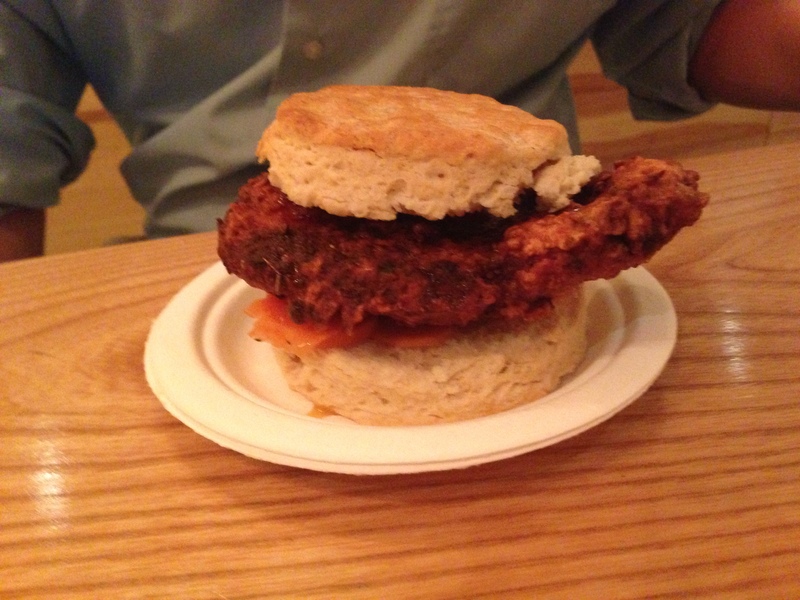 At this point, you may believe that I didn’t enjoy my experience at Empire Biscuit. I did, indeed. When you walk through the imposing wood-paneled front doors, you feel as though you’re in a cocoon. Empire Biscuit is tiny, to say the least, with fewer than 25 seats (I know this, not because I counted, but because they don’t have a public bathroom). A long counter runs into the center of the restaurant with some stools to perch upon. Everything is on an angle at Empire Biscuit, and I appreciate their lack of symmetry. The food is top notch, too. I ordered the biscuit with egg, bacon and cheddar, and it was delicious. 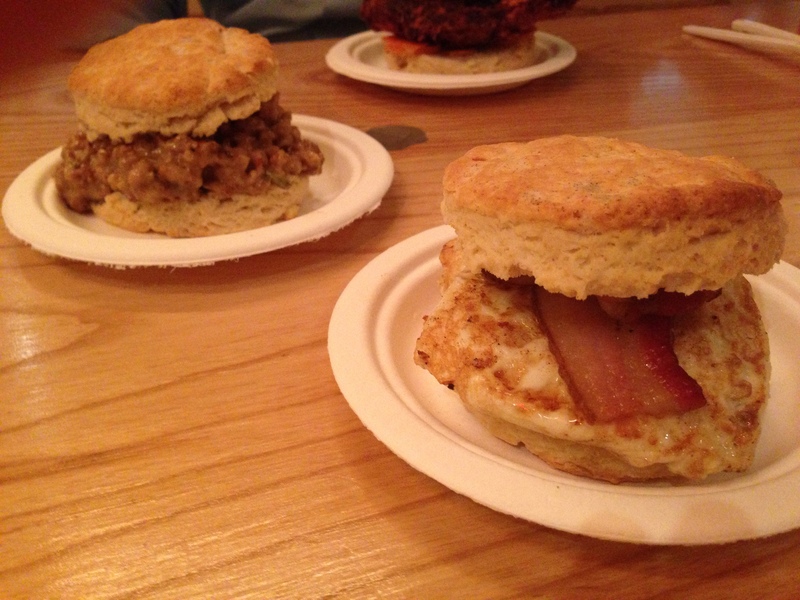 The bacon was so flavorful, and the biscuit, while anything but big and fluffy, was firm and formed a sturdy sandwich. My Dining Partner (MDP) got the biscuit with fried chicken, which featured a nicely fried breast of chicken and was excellent. For good measure, we also ordered the biscuits and sausage gravy. This is an interesting one–instead of ladling the gravy over the biscuits, the chef put the gravy in between the biscuit halves. Innovative? Not quite, but definitely delectable. The staff at Empire Biscuit were so gracious and kind, I’ll try to make it back there some day. Even if it’s at 1 am. Take the L to 1st Avenue and walk east one block then south 1.5 blocks.